The digitization of an original record is in itself a complex art. This work is very delicate in general, because there are many variables that we must take into account before "copying" a record to a computer. The long process begins with the cleaning of the record. Cleaning: The vinyl records (those called long play of 33 and a 1/3 rpm velocity, popularized from the mid ‘50s and used until the beginning of the ‘90s) can be cleaned with a solution that includes a small percentage of alcohol. The shellac records (of 78 rpm) can only be washed in a mixture of soap and water. Just one drop of alcohol could destroy this kind of record in a few seconds. To do a deep cleaning, we use a professional cleaning machine recommended by the Library of Congress of the United States. This marvelous invention for record cleaning is the VPI HW-17F. This machine applies the appropriate cleaning fluid with a brush that distributes the fluid in each groove of the record. Then, the suction arm vacuums all the accumulated dirt from the groove. This second operation is repeated in the opposite direction, guaranteeing a profound cleaning of the record. Once cleaned on both sides, this record is ready for the next step. Choosing the record needle: Over the years, the producers of shellac records and vinyls decreased the width of the grooves that contain the music. Summarizing briefly, we could say that the old shellac records of 78 rpm had very wide grooves, and as the recording companies perfected the system of recording and reproducing sound, these grooves were progressively smaller until reaching today’s modern vinyl format. For this reason, each record deserves an individualized analysis in order to choose the needle for its correct sound reproduction. Clearly, a record from the ‘20s will need a wider needle than one recorded in the ‘60s. Nevertheless, there are always surprises. The condition of the record influences in large measure the choice of the needle; the different types of needle point (conical, elliptical, truncated) each work better or worse according the kind and general condition of the record. Given the complex variables that we encounter in this process, we have chosen to build a toolbox of very good needles of different format and point width made by hand by the company “Expert Stylus” in Great Britain. These needles are used by countless professional audio restoration studios all over the world, and have achieved fame and unbeatable results when it comes to the correct playback of records. Cartridge: The cartridge is fundamental for reproducing the sound recorded on a record, because these little “translators” convert the mechanical energy (produced by the movement of the needle over the embossment of the groove of the record) into electrical energy that is then converted into sonic vibration by the amplifier that we have connected to the speakers. As in the case with needles, each type of record and recording period responds better to a certain kind of cartridge. For this reason, we have collected diverse top-level options, including various by Shure, Stanton, and Grado. Transcription Turntable: Among the different brands and models available, there are enormous variants which can help obtain a better or worse result. First, one must have a record player which allows one to play records of different speeds which are considered standard all over the world: 78 rpm (and its cousins), 45 rpm, and 33 and 1/3 rpm. At the same time—and having in mind that during the first half of the 20th century the speeds used by different companies could vary notably—it is fundamental to have a player which allows us the possibility of minute adjustments to the speed. For this reason it is important to use a stroboscopic disc, a simple tool that creates an optic effect that indicates the exact quantity of revolutions made by a record player plate per minute. In our case, we have chosen to use three different types of turntables; an EMT 950 BBC edition and a Thorens 126 mkII for 78 rpm and a VPI Scout for the vinyl records (45 rpm and 33 and a 1/3 rpm). Once this is verified, we are ready to choose how to amplify the sound that the needle captures. Preamplifier: Before 1955, the recording companies equalized their recordings following their own criteria with the objective of yielding the great possible use of the limited space on a record. The accounting is simple: the more bass frequency present in recording, the more space used on the record, which implies less remaining space and time for music. Based on this reality, the recording engineers designed different equalization curves that could reduce the space in the grooves at the hour of cutting or “printing” the record. That Equalization curve (or pre-emphasis) would later be compensated for by a counter curve (or de-emphasis) applied by the amplifier connected to the speakers. But this is a problem: until 1955, each recording company and each engineer designed and applied their own curve. The absence of an international standard—not created until 1955 by the RIAA (the chamber of the recording industry in the United States)—forces us to look for the correct equalization curve for each record. By any other means, we would not be listening correctly to what was recorded in the groove. To have a wide range of options, we execute the process of preamplification using an Elberg MD12 mk2, designed by the Danish engineer Jürgen Vlad. This machine allows us to reproduce the record in its pure form (without equalization, a process very recommendable when it comes time to make a faithful copy of an original), or with 12 historic equalization curves, based on those developed opportunely by classic recording companies like Decca, Victor, Odeon or HMV. Also, each of these curves may also be adjusted minutely if necessary to achieve the best possible result. In Summary: For every record recorded prior to 1955 there is a corresponding equalization curve, and to discover it one must try the different options and listen with great attention. Digitization: Shellac records, vinyls, cassettes and tapes contain analog information. To make a faithful copy in digital format one must achieve a “sampling” at very high resolution with professional audio equipment. We can’t forget that when we digitize we are, in some way, “taking a photograph” of the original. The more resolution our “lens” has, the more detailed and faithful will be our reproduced “image.” For this reason it is very important to have the appropriate equipment; in any other case, we would only be creating a low quality, degraded copy. For this process of digitization we have chosen Apogee converters, one of the international leaders in professional audio conversion, used widely in recording studios worldwide. To achieve a “faithful copy of the original,” the process is done at very high resolution: 96 kHz and 24 bit, a high standard used in professional audio and audiophile recordings. In the case of cassettes and reel-to-reel tapes the process is a bit simpler (when the material is in good condition). The reproduction of the cassettes is done with a Nakamichi DRAGON tape deck, according to many the best cassette deck ever manufactured. The reel-to-reel tapes are reproduced by an Otari MX5050, a real workhorse designed for the intense workload of a studio. In both cases, the step of passing through the amplifier is unnecessary, which is to say that the sound reproducer (tape deck) connects directly to the audio converter (analog to digital). Once the audio is digitized, the next step is a detailed audio review—listening carefully. While the verification of quality in each step helps us adjust the mechanics of transcription, we must always use this last stage of quality control before approving the final material. From this moment on—and once we have made backup copies on different hard drives—we can say that the record has been digitized correctly and that we have a “faithful copy.” No matter what, even if the original record breaks, this copy guarantees us the possibility of enjoying again the music that originally lived in the grooves of the record. All this material is ordered and classified through a record-keeping software specifically designed to manipulate large quantities of information and their respective metadata. This allows us to register all the information pertinent to this process: both the information about the music that was digitized, as well as the process of digitizing itself. 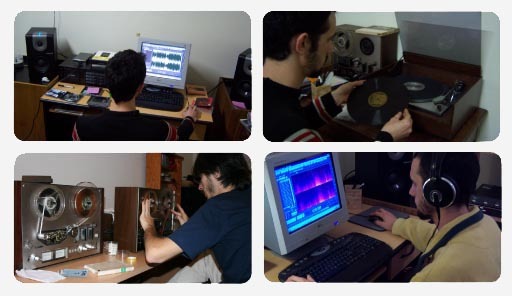 Restoration: Through an agreement with a restoration studio, we have access to one of the most sophisticated audio restoration systems in the world: the platform soundBlade by Sonic Stuido, model number 302, and the complete version of the software NoNoise II and reNOVAtor. These tools are truly miraculous. Through a combination of powerful algorithms specifically designed to work with damaged sound, this system gives us the possibility to remove a large part of the noise we commonly hear in records of vinyl or shellac, the whistle of the cassettes and the innumerable problems inherent to “antique” recording formats. Through a complex procedure, it is possible to “rescue” damaged recordings. Once the audio is digitized it is possible to apply different restoration techniques and achieve small miracles that were never before imaginable. And if to this we add a conscientious digitization, following all the steps we initially described, the standard of sound quality proves to be immensely to superior to the common commercial recordings of tango produced today.